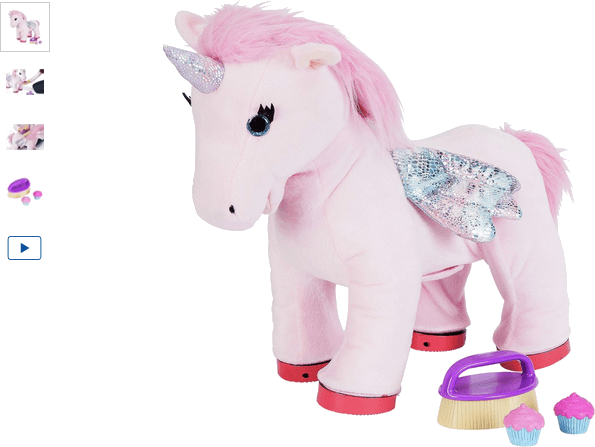 Sprinkle the world in magic dust with the Chad Valley Cupcake Animated Unicorn. This other worldly creature comes with two (2) mini cupcakes and a brush to keep her mane looking luscious. Press her left ear and listen as the magical unicorn neighs and whinnies, nods her head and wiggles her tail as she joyously trots on. Put the cupcake in her mouth and she'll makes chewing sounds, delighted at the tasty treat you've provided. Get money off with April 2019 free Argos voucher codes, see if there's a promo code for the Chad Valley Cupcake Animated Unicorn product. Argos may be out of stock of this product. To enhance your shopping experience you may also be redirected to a search results page when you click an outbound link.